Treasure ahoy! Linneys 18ct yellow gold and sterling silver cufflinks. For that rugged look, Kiss2Keep saddle leather and sterling silver bracelets. Barrio Dandy Vintage handcrafted bolo rings from The Normandie Collection. Patriotic Aussies will enjoy Ali Alexander's ‘Melbourne’ ring. Two heads are better than one with this Linneys sterling silver and champagne diamond neoprene bangle. Anthony Troiano ‘Terminator’ solid sterling silver ring with rubies. Lord Coconut stocks all types of manly pieces such as Ali Alexander's ‘Chicago’ ring . Keep the skullduggery to a minimum when wearing this Shinji Nakaba pearl skull jewellery. Barrio Dandy Vintage handcrafted bolo ring from The Normandie Collection, paired with a bandana tie. Shinji Nakaba pearl skull jewellery. Wear it with pride knowing pieces like this have been shown in art galleries around the world. The traditional trinity of the men's jewellery arsenal - watches, wedding bands and cufflinks - is no longer a confine as the old standards have to jostle for attention with statement pieces, bracelets and unusual gemstones. Bracelets used in stacked expression – mixing different pieces or layering multiples of the same piece, from chunky to thin – can bring a relaxed note to corporate attire or hint at the personality laying beyond a suit's sharp tailoring. No longer the preserve of surfers, musos or boho dressers, or treated merely as weekend staples, bracelets can suggest a world traveller, possibly of enviable means, as well as reminding the wearer of a special trip. Men's bracelets don't necessarily need to be made of precious materials to be popular. In fact leather and neoprene are buoyant materials at the moment. It's the way a person has put them together that creates an impression and their emotive pull supersedes an outward symbol of purchasing power. Kiss2Keep's vintage saddle leather designs with interesting stitching and embossing have a touch of rodeo cool, and the Utah based brand has options that go the distance from a executive setting to a relaxed rugged evening. Rough diamonds, with asymmetrical shapes, are the gemstone of choice. Mark Boldiston, owner of Melbourne contemporary men's jewellery boutique and online retailer, Lord Coconut, is seeing more and more of his customers looking for a dress ring with a bit of bling but without looking too 'gangsta'. "Once they know that rough diamonds are available, they're more open to looking at those options," says Boldiston. "The rough diamonds' attraction is that they aren't as refined looking as standard diamonds; they're a little rough around the edges much like the men who choose them." Ali Alexander, one of over 40 Australian based jewellers, designers and artisans stocked by Lord Coconut, has several pieces featuring rough diamonds. Black diamonds, whether small specimens used on pavé set designs made up of lots of small diamonds set closely together, or larger centre stones, are in demand. Says Boldiston: "Black diamonds are popular because they can still have a classic cut but the black colour is seen as far more masculine." Black jade is also a riff on this fade-to-black theme, as are oxidized metals. Skull rings are guaranteed to pack a punch, especially if Lemmy from Motörhead or Keith Richards are your style icons. Melbourne's Anthony Troiano is a jewellery designer with a cranium fixation. 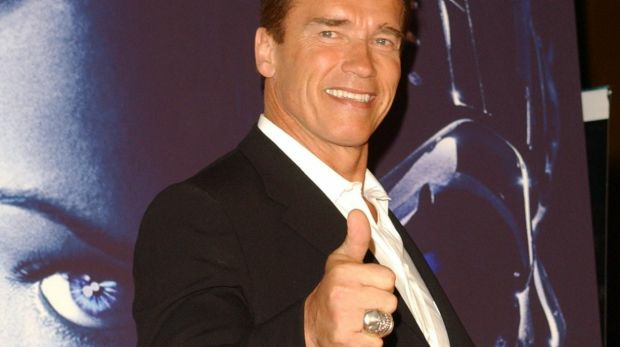 A prime example of his one-of-a-kind rings, a bejeweled Terminator with ruby eyes, is actually owned by the original cyborg assassin himself, Arnold Schwarzenegger (pictured below). Tommy Lee, Lenny Kravitz and Joe Manganiello are also fans of Troiano's custom made jewellery. But skulls don't have to be knuckledusters that have a menacing or rock 'n' roll edge. Shinji Nakaba is a Japanese jewellery designer who painstakingly carves diminutive skulls from pearls that make their way onto rings and brooches. His interest in the skull motif lies in how it represents the meaninglessness of life and the transient nature of all earthly goods and pursuits. Death has never looked so artisanal and ethereal and Nakaba's work has been shown at the Museum of Arts & Design in New York, as well as several galleries and museums around Japan. The skull is also appearing in dapper variations. Neckerchiefs and silk scarves were the accessory highlights in the Louis Vuitton, Hermes, Bottega Veneta and Ermenegildo Zegna collections. And at a more streetstyle-infused level, Los Angeles's Barrio Dandy Vintage has bolo rings that can be worn on the hand or to secure bandanas. The designers and purveyors of fine vintage clothing and men's accessories, are of course fine dressers themselves. Take heed from sartorial flair that deftly mixes periods: think a 70s suit with 40s brogues, and an art deco lapel pin. Or a zoot suit with '80s sunglasses. The dandy's hour is nigh but the key is to mix decades to avoid being a museum piece.